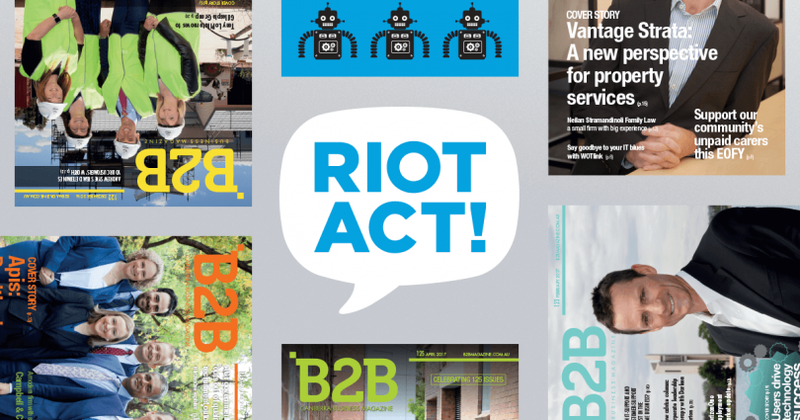 We’re excited to announce that RiotACT has finalised the acquisition of B2B Magazine, an iconic publication that’s been part of the Canberra business community for ten years. As you may already know, RiotACT is on a mission to become the primary source of digital regional news for people in Canberra and its surrounds. We see increasing local business coverage as a key to making this a reality. That’s where B2B Magazine comes in. Spanning 128 editions, over 4000 articles, and relationships with hundreds of local businesses, B2B Magazine is one of Canberra’s most trusted sources of regional business content. B2B Magazine will be incorporated into RiotACT’s business category and its founder, Tim Benson, will join RiotACT as a Business Development Manager. We are looking forward to working with Tim to map out the future direction of B2B Magazine and RiotACT over the coming weeks, and to ramp up our coverage of Canberra business news. RiotACT is actively seeking to acquire additional media assets to both expand its geographical footprint and increase our content depth in a number of verticals. Canberra, Australia – 17 July 2017 – Canberra digital regional news and opinion platform RiotACT (the-riotact.com) has today finalised the acquisition of B2B Magazine, an iconic publication that has been part of the local business community for more than ten years. The acquisition comes as RiotACT moves towards becoming the primary source of digital regional news for people in Canberra and its surrounds. RiotACT co-owner Tim White said B2B Magazine’s history, brand capital, and loyal readership would play a vital role in accelerating RiotACT’s regional business coverage. “Spanning 128 editions, thousands of articles and relationships with hundreds of Canberra businesses, B2B Magazine is one of Canberra’s most trusted sources of business content,” he said. B2B Magazine founder Tim Benson said he is looking forward to working with RiotACT owners Michael McGoogan and Tim White to map out the future of B2B Magazine. He will join RiotACT as business development manager. “Michael and Tim are well-known to the Canberra business community. Their reputation and success with companies such as Allhomes and Uber Global speak for themselves,” he said. Since taking over RiotACT in August 2016, Tim White and Michael McGoogan have built the site into one of Canberra’s leading digital news and opinion outlets, with over 150,000 unique website visitors each month. Tim White is the former CEO of Allhomes and the driving force behind its $50 million acquisition by Fairfax in 2014. Michael McGoogan is a serial tech entrepreneur and the founder of UberGlobal, one of Australia’s largest cloud service providers which sold to MelbourneIT for $15.5 million in 2015. Michael said the acquisition of B2B Magazine is unlikely to be their last. “RiotACT is actively seeking to acquire additional media assets to both expand its geographical footprint and increase our content depth in a number of verticals. The acquisition of B2B Magazine and its Capital Magazine assets [not currently in print] is the first step in ramping up our coverage of Canberra and regional news, while adding substantial value for our readers,” he said. The July edition of B2B Magazine will be distributed later this week. Media interviews with RiotACT owners Tim White and Michael McGoogan are available on request. RiotACT was established in 2000 as a community news and discussion website. It was acquired by Canberra technology entrepreneurs Tim White and Michael McGoogan in August 2016. With a new commercial direction and strong contribution and moderation guidelines, the new RiotACT has become one of Canberra’s most popular websites. It attracts over 150,000 unique website visitors per month, and has an average monthly Facebook reach of more than 550,000 across the Canberra region. the-riotact.com.